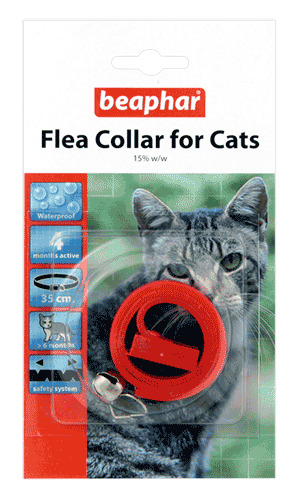 The Beaphar Plastic Flea Collar for Cats is an excellent way to keep the fleas at bay. It contains an insecticide which kills fleas and keeps them from coming back for up to 4 months. The water resistant collar has been specially designed to stretch if pulled so if your cat gets stuck they can pull their head out. Each collar comes with a silver bell, and the reflective collar allows your cat to be seen easily in darkness. Suitable for cats over 6 months old. Colours are randomly allocated. Each collar contains 15% w/w Dimpylate (2.1g dimpylate per collar). This collar has been specially designed to release your cat if it becomes caught up. To fit the collar, simply slide the free end through the buckle, and tighten to leave enough room to insert two fingers between the collar and neck. Do not fit too tightly, to ensure against irritation, but do not fit too loosely, or the cat may be able to get a foot or tooth under the collar, in an attempt to remove it, and become caught up. Remember to periodically check and loosen the collar if fitted onto a growing cat. Cut off any excess collar with scissors, and throw it away with your domestic rubbish. If your cat should become caught up, the special design will allow the collar to stretch, enabling your cat to slip its head out. There are currently no questions for Beaphar Plastic Flea Collar for Cats - be the first to ask one!